Conceptual Physics: What are PROMPT and DELAYED Neutrons in Nuclear Physics? 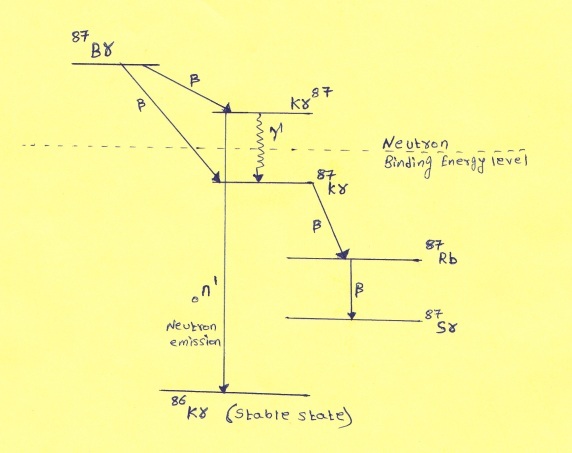 What are PROMPT and DELAYED Neutrons in Nuclear Physics? In the process of fission, the capture of a Neutron leads to formation of excited compound nucleus and thus breaks into two nuclear fragments having excess neutrons and energy of about 8 MeV which is sufficient to expel neutrons. Such neutrons which gets emitted in time scale of order 10^-14 sec are called prompt neutrons. They have energies of order of few MeV generally 1-2MeV. On the other hand, some fission fragments decay in various modes to become stable. 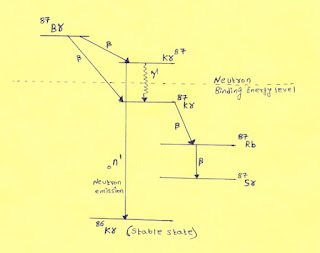 In this process, fragments which undergo beta decay, some times forms product nucleus left in excited state with an energy more than average binding energy which then emits neutron to reach stable state. 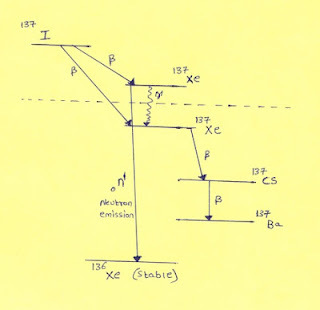 Aas this neutron emission follows beta decay of preceding nucleus and so neutron activity of that element will have some apparent half life due to beta activity of parent nuclide, usually of order of mSec to few Sec. This type of emission is called Delayed Neutron Emission and neutrons emitted are called delayed neutrons. You can see the decay scheme for two well known fission fragments Br-87 & I-137 exhibiting delayed neutron activity.